Project Getaway participants at FNPF's Community Centre on Nusa Penida Island. A group of entrepreneurs from all over the world recently converged on our Nusa Penida island bird sanctuary to brainstorm ways to develop our projects and give a boost to the local population at the same time. FNPF’s Bali Bird Sanctuary on Nusa Penida, the only one of its kind in Indonesia, provides an island haven in a country that has the world’s second-highest number of endangered birds. Within the sanctuary we rehabilitate and release ex-captive endemic birds, we are also involved in reforestation and run community development projects to improve the wellbeing of local people. The sanctuary has the backing of the island’s 46 villages and it is estimated the sanctuary is today home to more than 100 Bali starlings, one of world’s most endangered birds. 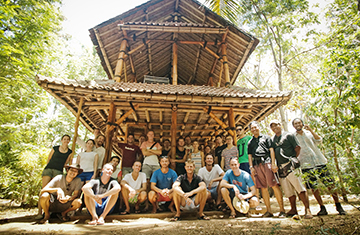 The group of 26 entrepreneurs were on a one month trip to Bali as part of Project Getaway – a retreat focused on networking, brainstorming, and enjoying and exploring a tropical paradise island. Their trip included brainstorming exercises where they spent time learning about several organisations and their challenges, and then offering solutions. They focused on people and organizations they felt doing were doing interesting work, including us. Tom Huges, a Project Getaway co-founder says the trip to Nusa Penida was their opening event. “It was definitely very interesting as we got to know each other and it was interesting to see how sustainability is implemented on the island. We would love to leverage our participants to help with a project like FNPF. “The brief was to brainstorm how people on Nusa Penida could re-purpose or re-brand local invaluable resources to be of value in other places,” says Tom. The entrepreneurs came up with several ideas during their visit including projects ranging from the production of organic fertilizer and coconut based products, to seaweed farming and building a brand for the Bali starling. The ideas have been compiled and a possible project is in the planning stages.